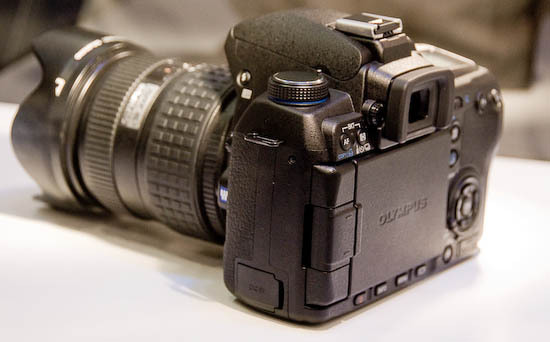 Olympus has shown a mock-up of its next Four Thirds E-system DSLR. 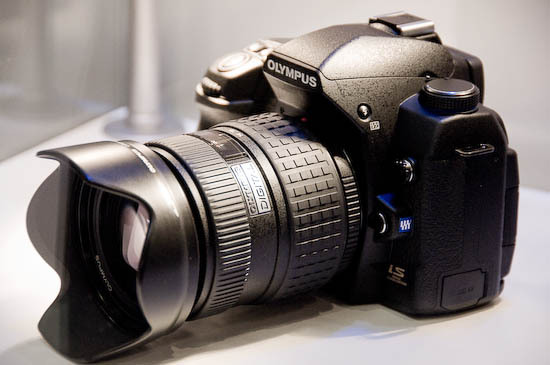 This is a conventional - if the word can be used - DSLR, rather than a non-reflex, mirror-less, Micro Four Thirds camera, which Olympus has also revealed plans for producing (see separate story coming soon). 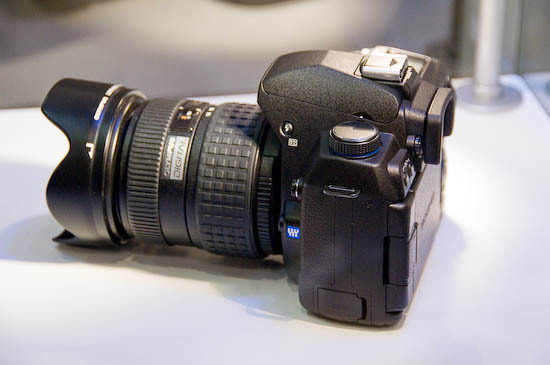 Details are sketchy, but after talking to various Olympus people this morning, my understanding is that the new, and as-yet unnamed, DSLR will slot inbetween the flagship E-3 and the mid-range E-520. The new model looks very similar to the E-3, but will be a metal frame and engineering plastics shell, rather than the exotic injection moulded light alloy structure of the E-3. On the other hand, I was told that it's likely that the new camera will have a certain level of weather sealing. Other similarities to the E-3 include an articulating live view screen, though it's not yet clear if it will be a larger or higher resolution version of the E-3's 2.5 inch screen. 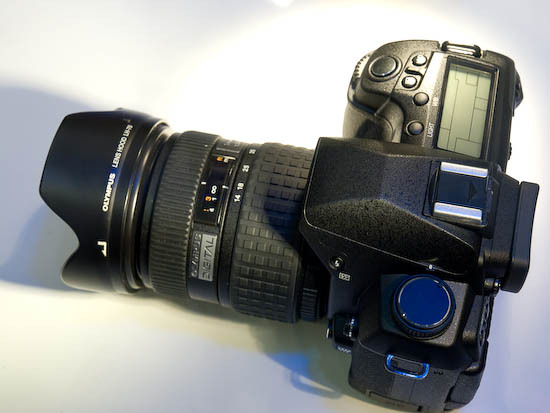 One noticeable difference is the reappearance of a mode selection knob on the left 'shoulder' of the camera - from the photographer's viewpoint behind the camera. Opinion has been polarised concerning the E-3's design which relies entirely on mode buttons and adjustment wheels. 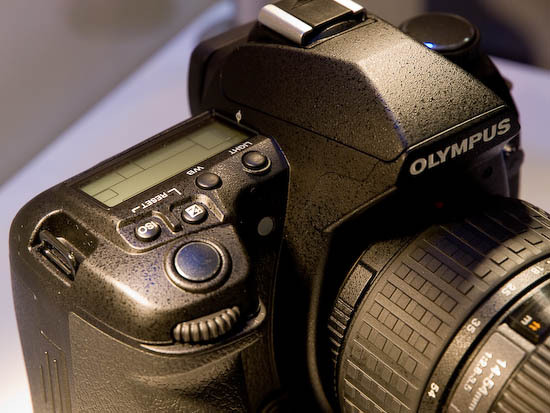 We hope that Olympus will install a sensor similar in quality to the 12 megapixel LiveMOS part currently used by Four Thirds partner, Panasonic Lumix, in their new DMC-G1 Micro Four Thirds camera. 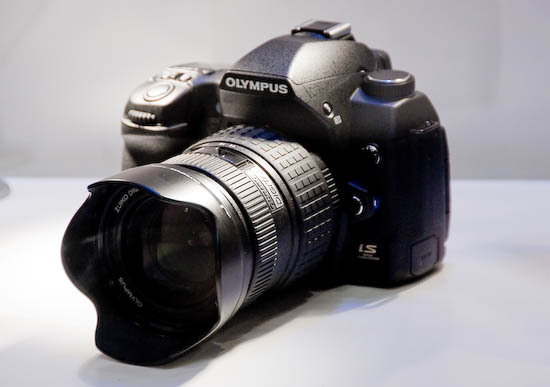 The new sensor is not only higher in resolution than the 10 megapixel sensor that Olympus makes do with at the moment, but it also exhibits significantly better high ISO image quality. 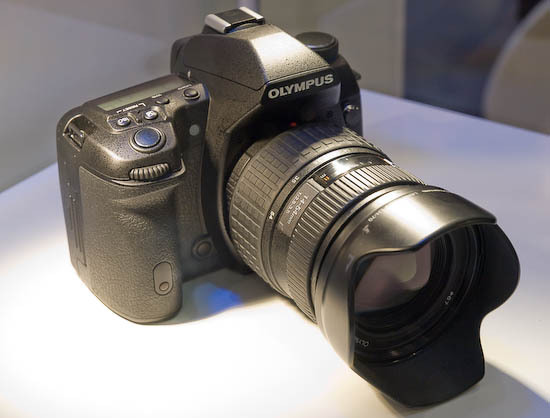 Below is a series of views taken of the new Olympus E-System DSLR when it was unveiled on the Olympus booth earlier today. Please forgive the quality of these images as there was much jostling of journalists around the display, the camera was inside a plastic showcase, and the lighting was very poor, but you can certainly get a feel for what Olympus has in the E-System pipeline. Np pricing or availability was discussed. My hunch is that we will see a working version, close to market-readyness, at PMAin Las Vegas next February.